Use foam buffing pad technology without using a buffer! The CCS Euro Foam Polish Applicators allow you to match polishes to the appropriate foam variety, just as you’d do if you were applying the products with a polisher. Now you can get better results by hand because the applicator is enhancing the performance of the product. Work smarter with CCS Euro Foam Hand Polish Applicators! 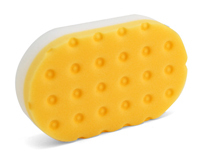 These imported foam applicators utilize CCS Technology™, just like machine buffing pads. CCS pockets, as you can see in the photo, cover one side of each applicator. The pockets create spaces for excess polish to accumulate – without soaking into the foam – until it is needed on the work surface. Then the polish is drawn up through the center dimples of each CCS pocket and onto the applicator’s work surface. This design saves product because the CCS pockets significantly reduce product absorption. Orange Light Cutting Applicator – The orange foam is the most popular type of foam used in making buffing pads. It has a texture like memory foam but denser. It can be used to remove light to moderate swirls with little or no loss of surface gloss. White Polishing Applicator – For general polishing and pre-wax cleaning, we recommend the white polishing foam. This is one of the most versatile foam compositions. Use it to apply finishing polishes, pre-wax cleaners, and all in one products. Red Ultra Soft Finishing Applicator – The red foam is designed specifically for the application of waxes, sealants, and glazes. It has no cut or cleaning ability. The soft foam will not leave any haze and it is gentle on all automotive surfaces. Use the red foam applicator with any last step product to product a smooth, flawless finish. Gold Jewelling Applicator - Use the gold pad to apply a very fine polish or glaze as the final step of the polishing process. Jewelling is the term coined for this step because it intensifies gloss and reflectivity, like a jewel. The gold foam pad also works well for wax and sealant application. Each Euro Foam Hand Polish Applicator is 6 x 3.75 x 1.25 inches. The oval shape is easy to grip and the applicators have enough surface area to cover a lot of paint quickly. Related Items - CCS Euro Foam Hand Applicators Trio - You Pick!